Not every successful recruiter started their job as a headhunter. Some were accountants, engineers, store managers, sales representative, etc., before they started recruiting. Staffing firms say their top performing recruiters happen to be industry experts in very specific areas. Their prior experience in these areas allowed them to develop wide networks of potentially great talent, that they nurtured and expanded over time. These connections allows these niche recruiters to easily find great people who are open to exploring new career moves. It’s similar to farming – recruiters need to understand the nature of the industry and the currently available candidates. They should nurture and build relationships, so that they may eventually place these candidates successfully. Before you can start farming, you have to prepare the land. The same with recruiting, first you have to arm yourself with the knowledge on the industry, the job opening, hiring manager, the hiring team, and the company culture. This will help you assess the best strategy in finding good candidates. For example, if you are trying to fill a position for software developer, going to a hackathon might be more useful than putting up a job ad on Monster. When you understand the industry, you will know how to approach recruitment better. 2. Build your niche network. Farmers take time to build relationships with shop owners in order to get them to carry and sell their crops. In the same way, recruiters need to earn the trust of both the hiring managers and candidates. Building a niche network will help you get a reputation in the industry as a person handling the best jobs and placing the best candidates. Planting seeds is a back-breaking job that needs a lot of effort and patience. Same is true for recruitment. Before a potential candidate even agrees to engage in a serious conversation, they need a long nurturing process. Once they agree to have a conversation, it can still take a while before the person could even get hired. Be patient and continue nurturing your relationship with the candidate. Sooner or later, this can lead to a successful hire. 4. Take out the weeds. In farming, weeding is an important task to make sure you have quality crops. In recruitment, weeds could be low quality candidates who, for some reason, end up on your table. This is common when doing mass recruitment via job sites or classified ads. The best way to weed out candidates who are unfit for your position is to focus your recruitment energies onto referrals. Referred candidates have been pre-screened by their referrer and are more likely to perform better than non-hired candidates. Take advantage of who you know in the industry and ask them to refer candidates to you. Reward them with incentives for every successful hire. 5. Reap what you sow. With your patience and hard work, you will have with you, select and quality candidates to tap into, whenever the opportunities arise. You have tended to your potential hires with good care and it’s now time to harvest what you have sowed. Keep in touch with them on various social networking sites and reconnect with them from time to time through emails or quick coffee meet-ups. This way, they will remain on your radar (and you on theirs), for years to come. Recruitment is not as easy as throwing seeds on an empty land and watch them grow. It’s a tedious process of cultivating and nurturing, before you could even reap what you sow. All it takes is hard work and patience, and before you know it, you will have the best talent farm there is. 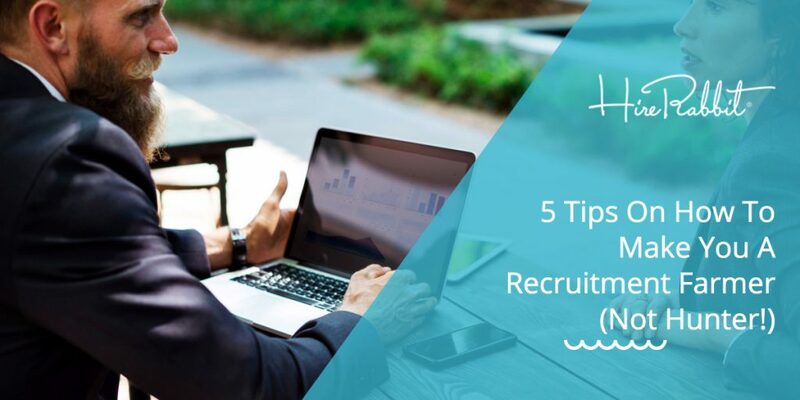 Do you have other tips on how to improve recruitment strategies? Share them in the comments below. Are you looking for a way to improve recruitment in your company? Visit HireRabbit for a free trial.